Classy, yes. But is it a case of chic before practicality? Touch the power key on the side, and the black beauty comes to life. Update: read our LG Chocolate BL20 review. Give a phone a name, not a number, and people will fall in love with it. It's an approach that has been successful for Motorola with handsets like the RAZR, and the StarTAC before. It is not a ploy that is guaranteed to work - but LG seem to have got the formula right with the Chocolate. Back home in Korea, this slinky little thing has become a sales phenomenon - and now it is successfully wooing the Brits. You know you have got something special and extravagant as soon as you take hold of the box. Like a top French perfume, the packaging is supersized and super-sumptuous. Get to the phone, and you have an ultra-smooth black casing, where as much of the phone is hidden from view as possible. There are a couple of keys down each of the side panels - but from the front there is little to see. There is no obvious frame to the screen, and no obvious keys to navigate with. Touch the power key on the side, and the black beauty comes to life. The 176x220-pixel screen can be seen, and red LEDs show you the position of the buttons. 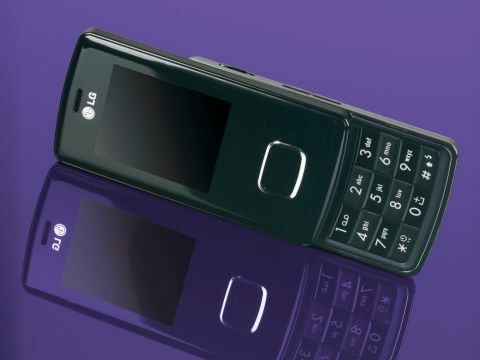 But these are not ordinary keys - the phone uses touch-sensitive controls, so as not to destroy the mysterious appeal and aerodynamic lines of the handset. In effect, it is a case of chic before practicality. The touch control can be hard to get used to as it is so easy to press the wrong key, despite the oversized joypad arrangement. Find a track you want to listen to and start it rolling, and you are likely to press cancel accidentally, and have to start all over again. The highly-polished surface looks tantalising, but as soon as you pick it up it becomes noticeably covered in finger prints. And confusingly the end call button is on the side of the phone, where you would least expect it. It is a reasonable performer, though. The media player delivers a pleasing sound - and a two-part headset means that you can plug in any headphones with a 3.5mm jack. There is no card slot, but like a standalone MP3 player, there is plenty of memory onboard - 128MB, in fact - far more than on most phones. Loading tracks onto the phone is made simple (using a Mac or PC) thanks to a USB connection that supports Mass Storage plug-and-play. Pictures from the 1.3-megapixel camera are of a high enough quality to print out.